Although I had always been passionate about the environment and sustainability, and did my best to make my “green” lifestyle choices, I always felt that I could do much more. Before leaving the training, I promised myself I would use what I learned to increase environmental awareness in my hometown. I grew up in a town of 500 people on the East Coast of Newfoundland called Port Blandford. Until recently, residents of rural Newfoundland retained many traditional practices that sustained communities for hundreds of years, such as subsistence fishing and hunting, cutting firewood, picking berries, and growing and preserving vegetables. Unfortunately, these activities have fallen to the wayside as a result of collapsing wildlife and fish stocks, busy urban living, and the demand for more convenient choices. Through the IMPACT! 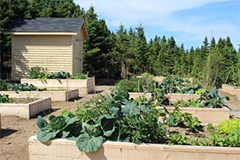 Fund and a lot of help from my mom, I decided to use my experience and knowledge of community gardening to start the Port Blandford Community Garden. I was surprised at the initial interest and support from the community. Despite being in a small town, there was always a readily available crew of volunteers. 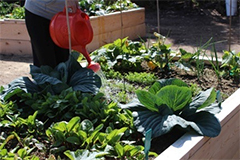 Our ten original garden plots were quickly assigned to both new and experienced gardeners of all ages, and most were shared to keep up with unexpected demand. The town’s Green Team donated two additional beds and held a presentation about composting, seniors shared their knowledge, and kids were eager to learn from them. Throughout the summer plants flourished and we were rewarded with a generous harvest of root vegetables, greens, onions, herbs, and broccoli, to name a few! Because of last year’s success, I was granted a second IMPACT! Fund grant to expand the garden with seven additional beds, fruit and berry trees, and most excitingly, a greenhouse to extend our short growing season. We already have new gardeners eager to tend to all of the plots, while returning gardeners are excited to try different crops in the greenhouse. We recently held a successful planting session to start indoors crops inside early. I left inspired to see many new gardeners excited about planting their first seed, from preschool kids to busy moms and seniors. Ideas are like seeds. Without attention and care, neither will grow. IMPACT! gave me the seeds I needed to grow my ideas into reality. Do you have a sustainability project, initiative or idea that you want to pursue? Consider applying for our IMPACT! Youth Sustainability Training to connect with other youth that care deeply about the fate of the planet, its people and their future. For more sustainability resources and stories, follow IMPACT! on Twitter and Facebook.